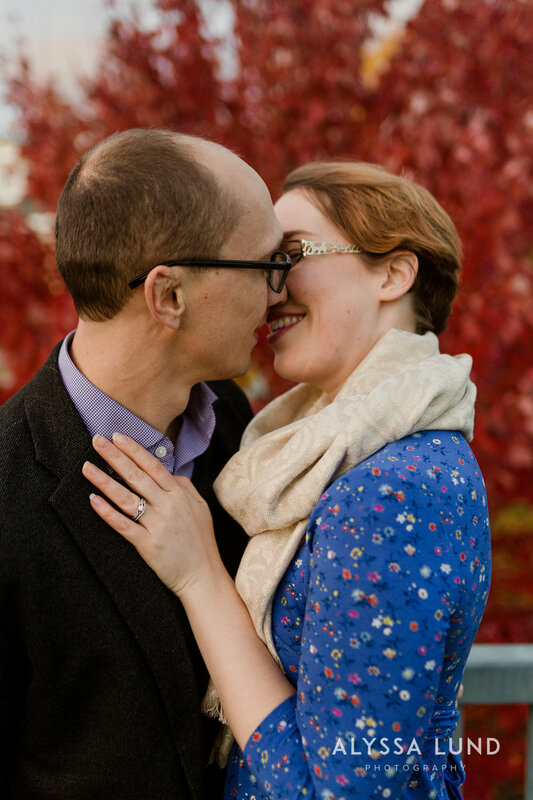 Melissa and Andrew and I started chatting last fall to plan a session for their first anniversary after getting married. I photographed their St. Mark’s Cathedral Wedding and St. Anthony Main Engagement Session and was excited to see them again, and to continue documenting their relationship with anniversary portraits. 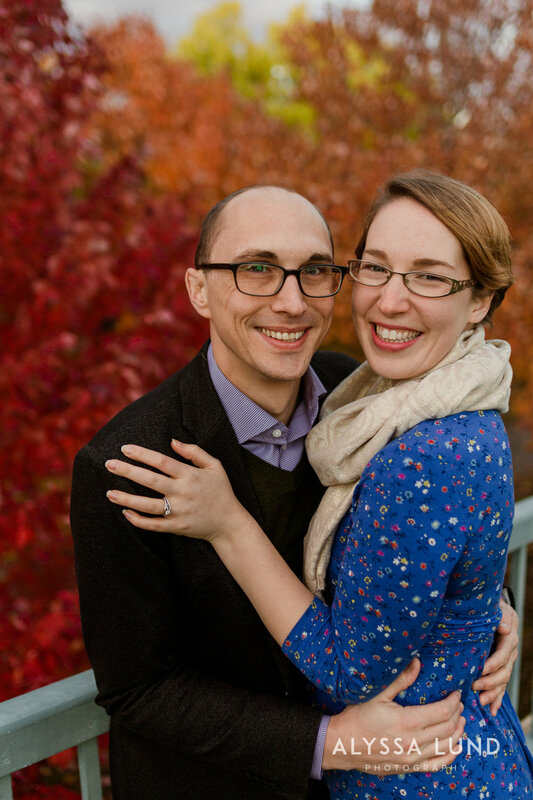 While we were on the phone talking through ideas for their session, Melissa shared that she and Andrew recently found out they were pregnant. They were really excited to do the anniversary session on its own, and also realized they could use these photos to announce their pregnancy to friends and family. It was perfect timing for a happy anniversary session! 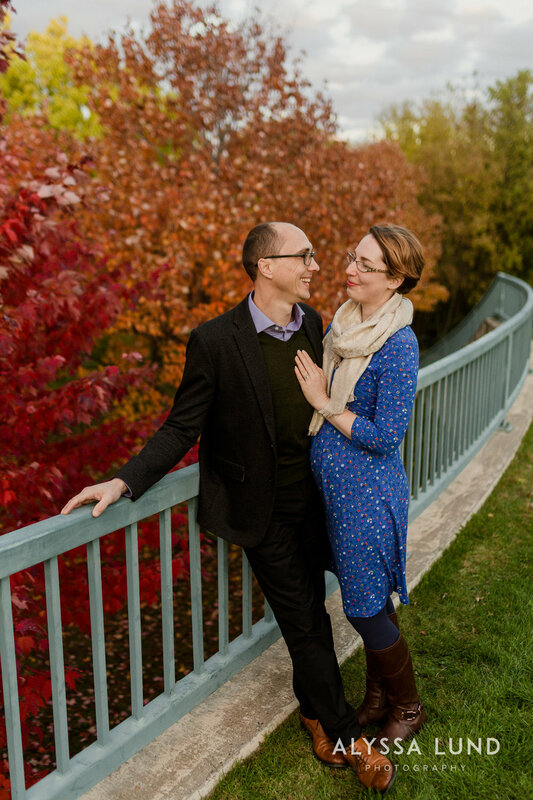 The evening of their session we met on the garden side of Minnehaha Falls Park for a lovely mid-October walk. As I photographed them we were treated to blazing, glorious fall colors and the most perfect light. We even found a bright, deep red tree and standing in front of it Melissa and Andrew are so full of life. Their radiant smiles in these portraits speak volumes of their joy and excitement over sharing their pregnancy news. In the relatively short time frame of their session there was so much change in the light, and I love the course it took. At the start of their session, the sky was pale-blue and gray and by the end of it, right as the sun disappeared below the horizon, the sky had a pinkish hint to it. In between these color shifts, we captured the sunset blazing behind them as they shared a kiss, the trees in the distance lit with golden light. 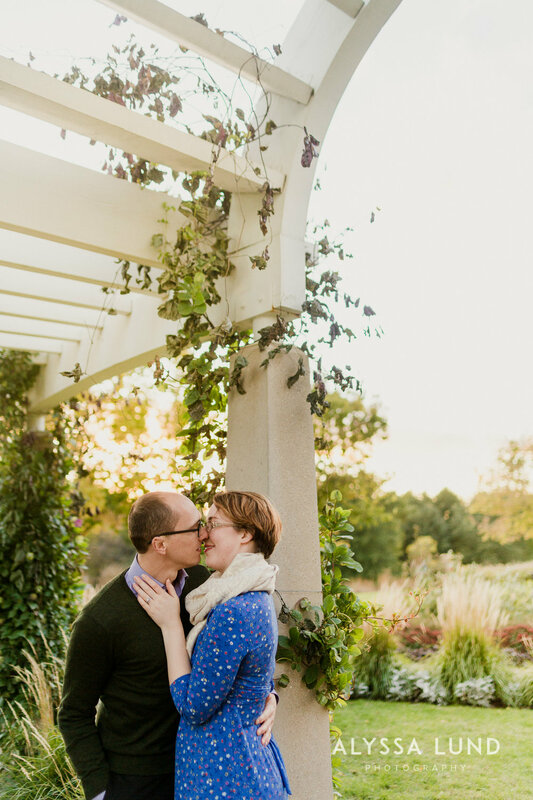 Melissa and Andrew, thank you for sharing your energy, joy, and excitement with me yet again - I can’t express what an honor it is to continue getting to work with you both :) I am so excited for you in this season of life and I can’t wait to meet your little baby this spring!